Here’s to a great 2010 for you and yours. Fred Perry is one of my favorite labels, a classic British brand that manages to stay fresh with top-notch and interesting collaborations with the likes of Raf Simons and Comme des Garcons. This selvedge edge denim chambray shirt is a perfect example of the innovation that has reinvigorated the brand in recent years. I especially like the small collar. The sleeves are admittedly a bit awkward in length, so I recommend styling it like they do at oki-ni (on the weird unibrowed model they use for everything), by giving it a little cuff that still shows off the selvedge detailing also found on the back yoke and front pocket. Speaking of oki-ni, this shirt is currently on sale there — so if you or someone you love is a size L or XL, jump on it. A few more pics after the jump. All photos taken Nov. 15, 2009 — for more, see s. dool photos. Since I’ve had to employ a steady rotation of button-downs and oxford shirts five days a week at work for the past few years, I’ve made a conscious decision to look for ways to break up the monotony within the confines of office-appropriate attire. Trovata, the California-based label and favorite of artfully tousled prepsters everywhere, is always good for some unexpected, quirky design details to mix things up a bit. I picked up this striped shirt last week at Gilt at a pretty good discount. 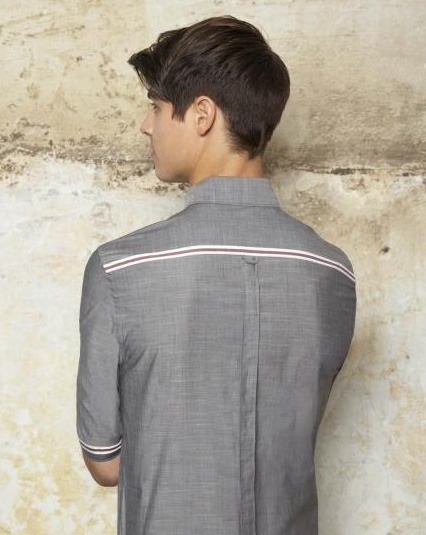 In addition to the hidden placket and the lone buttoned pocket, the shirt features some of the signature contrast piping inside both cuffs and a button-down collar fastened from underneath. More photos after the jump. 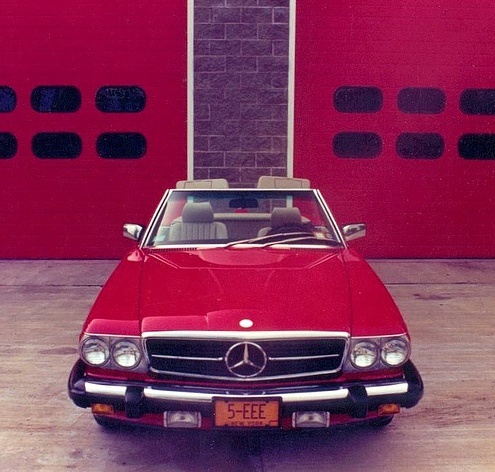 I recently decided that should I ever move out of Manhattan and find myself in need of a car, my top choice would be an iconic Mercedes Benz 560SL. I’m far from being a car enthusiast, but there is something in the simple, retro-futuristic design that I find very appealing. It’s boxy, and very, very 80’s – a pair of Wayfarers on wheels, if you will. Seeing as I have no plans to leave New York in the foreseeable future, this remains just a pipe dream, but a very stylish one at that. See a few more pics after the break.